Ecosophy produces textiles for the home that are thoughtfully designed and sustainably made. Our name combines eco (from the Greek oikos, meaning ‘household’) and sophy (from sophia, meaning ‘wisdom’). This dual meaning of 'ecological wisdom' and 'household wisdom' reflects our goal, which is to help our customers make ecologically wise choices when decorating their homes. Ecological wisdom is, at its heart, about relationship. It is about recognising that we are part of a web of connections - to plants, animals and people - and that living in a way that is mindful of these connections is good for ourselves and our planet. At Ecosophy, we try to develop this wisdom through taking a responsible approach to production: using environmentally friendly methods, working with fair trade and artisanal groups, and tracing all stages of our supply chain, so we can tell each product’s story from seed to stitch. Ecosophy was founded by Kate Anderson, who has a background in anthropology and a life-long love of interior design. Inspired by her studies of artistic traditions around the world, which often use decoration as a tool for expressing relationships to the wider society and cosmos, Kate decided to explore how decor could be used to create positive connections between our homes and the wider world. To do so, she set off on a journey that took her through India and Bangladesh, meeting with farmers and artisans who were pioneering sustainable forms of production. Partnerships with these groups soon followed and Ecosophy was officially born. We are inspired by natural patterns and textures, and believe beauty comes from designing with nature rather than against it. For this reason, we work with natural fibres only and most of our products are dyed with pigments from plants or other natural sources. Designing with natural materials can be challenging at times - in choosing colours, for example, we have to wait and see what natural dye combinations produce rather than deciding in advance what we want - but the process is humbling and the materials we end up with have a depth and complexity that are impossible to find with synthetic alternatives. We consider all stages of production and try to make responsible choices for each. We use natural fibres that have been sustainably produced, and either natural dyes or low-impact GOTS-approved dyes. Our producer partners all promote safe and fair working conditions and many are fair trade certified. With the exception of our bed linen fabric, which is too large for a hand loom, all of our fabrics are woven by hand. Hand weaving is a sustainable form of production as it requires no electricity or other carbon-intensive inputs. It also provides an important source of income to rural communities, particularly in Asia. Textile production is a complicated process, with many actors playing different roles, from the farmers who grow the fibre to the weavers who create the fabric and the people who stitch it into the final product. We visit as many of these actors as possible and spend time with them so that we understand how, where and by whom our collections are made. We then communicate this to our customers so that you gain some insight into the people and processes behind our products. 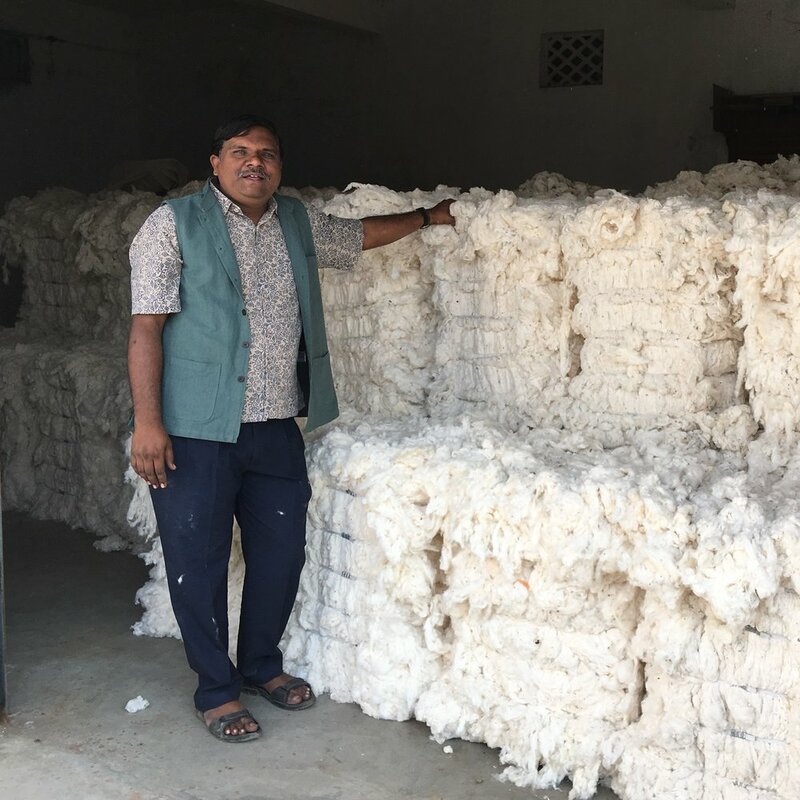 Photo: Mukesh at Magan Sangrahalaya Samiti explaining the baling stage of cotton production.